Finalists: Lachlan Zidar and Jared Crowley with the two inventions that could save lives. Photo: CSIRO. 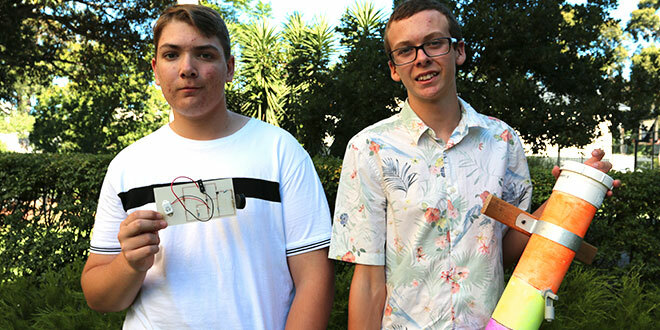 ASPIRING engineers Lachlan Zidar and Jared Crowley are on the path to changing potentially hundreds of lives with two homemade inventions – and they’re only 14. The Year 9 students from Marymount College, Burleigh Heads, were named finalists for the BHP Billiton Foundation Science and Engineering Awards, held in Melbourne last week. Both Lachlan and Jared were nominated for creating devices that are capable of saving people from one of nature’s deadliest elements – water. Lachlan has created a laser-activated pool alarm system, which operates through a circuit board connected to a light-dependent resistor, or LDR. Any break in the laser system will deactivate the LDR and eventually set off an alarm. If set up in a pool with mirrored sides, the device can shoot lasers across the entire surface of a pool. The device was first designed for Lachlan’s school’s Science night and was eventually given national recognition as an entry for the BHP awards. Speaking to The Catholic Leader, Lachlan said he came up with his idea after reading back-to-back news reports of children drowning in pools. Having watched movies where valuable items were protected by a laser device, he decided to adapt the technology to prevent other children from drowning. “In the last financial year, thirty-one children aged four and under drowned,” Lachlan said. While the idea of using lasers to protect valuable items like diamonds or banks is not new, Lachlan believes this is the first time the system has been designed for a pool. But with no similar prototypes on the market, the 14-year-old had to teach himself how to wire a circuit board to bring his laser-activated alarm system to life. “For children, I hope it keeps them from drowning,” Lachlan said. Lachlan said alarm systems for pools protected fencing but there was nothing on the market that monitored the surface of a pool. Despite not winning at the national awards in Melbourne, Lachlan still hopes to pursue a career in electrical engineering and patent his idea in the future. Fellow classmate Jared Crowley was also close to winning at the national awards with his innovative automatic flood warning device. Jared’s created his invention after his family home on the Gold Coast was flooded in the devastating aftermath of Cyclone Debbie. “Cyclone Debbie came through and it flooded our whole backyard and it ended up being ankle-deep inside our house,” he said. When asked to create a science project for school, Jared thought back on his flooded home. “Because Cyclone Debbie had come through I decided to make something that could help property owners,” he said. The device is inside a tube marked with various measurements, and is connected to a motherboard connected to a GSM (global system for mobile). A sim card attached to the float sends a text message to a subscribed receiver when it reaches a particular level. It could prevent property owners from finding out too late that their homes are flooded. Jared coded the device on an electronics program called Arduino, which was introduced to him last year by his digital technologies teacher. “Because there hasn’t been anything used like this I had to look up all this different coding to make it all because I basically had to make it from scratch,” Jared said. His teacher “helped to the best he could”. The 14-year-old said he never expected to be recognised on a national scale. “I was really shocked,” Jared said. Jared now hopes to sell his device to people impacted by the floods or who need instant communication about water levels, including those who rely on water tanks. The winners of the BHP awards were Oliver Nicholls, who designed an autonomous robotic window cleaner; Minh Nga Nugyen, who came up with a way to recycle waste into a biochar; and Angelina Arora was awarded for her innovative bioplastic made with shrimp shells. The BHP awards are supported by the CSIRO and Australian Science Teachers Association, and have been supporting young people’s achievements and interest in science, technology, engineering and mathematics since 1981. CSIRO chief executive director Dr Larry Marshall said the winners’ and finalists’ ideas could inspire other students to solve today’s challenges. “We know that the achievements of the winners and finalists will inspire other students to become innovators solving the big challenges that face our world,” Dr Marshall said.